The week before last, I used stills from the movie all week, then last week I broke down the first 15 minutes. After that, I couldn’t resist re-watching the whole thing, and wow, the rules started flowing! So now we have... Misunderstandings can be a crutch when used to prop up shaky writing. Captain America was a lot of fun, but the weakest plot turn in that movie showed the danger of relying on an unironic misunderstanding. 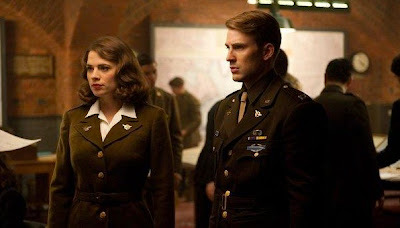 At mid-movie, everything is hunky dory with Cap and his love interest. They’re both super-nice, so there’s no room for any real drama in their relationship. But the writers nevertheless felt the need to put a bump in the road, so they fell back on that old standby... Out of nowhere, a vixen-ish secretary jumps Cap’s bones as he’s leaving the war office. Before he can turn her down, his crush walks in and sees them together, then runs away. Ugh. This false conflict could be resolved with a simple explanation, but, as usual, the misunderstanding snowballs out of control. Why do this? Why not generate an actual difference of opinion between the two, so that a genuine dilemma can help fuel the drama, instead of a meaningless mix-up? The Apartment, on the other hand, shows the value that an ironic misunderstanding can have. Baxter’s neighbor spends the entire movie convinced that Baxter, and not his bosses, is bringing all those women back to his apartment. This adds a thick layer of irony to all of their discussions. Baxter accepts the criticism because he wants to be gentlemanly and not expose his bosses’ affairs, but as a result he looks like a massive heel. The audience bristles with indignation to hear our hero falsely accused, but we also know that what Baxter’s doing is wrong, and so we know (as he knows) that he does deserve this criticism, even though it’s misdirected. This irony is compounded when Baxter, Miss Kubelik, and the doctor are all in the apartment together. Baxter must now take the blame for her suicide attempt to cover for his boss, Sheldrake. As the doctor’s criticisms get more severe, Baxter must totally adopt the persona of Sheldrake, quoting his boss’s cruel dismissals of Kubelik as if they were his own. This attempt to identify with his boss has the opposite effect on Baxter: It forces him to finally realize just how despicable Sheldrake is. Baxter has to become what he fears, which shows him what he really wants to be. It also results in the advice he most needs to hear, even if he hears it for the wrong reason: be a mensch. Imagine a different version of this scene: Baxter truthfully explains the situation and the doctor sympathetically suggests that Baxter should stand up to his terrible boss. That would be far less powerful. The misunderstanding in Captain America is unironic, and tests the audience’s patience. The many misunderstandings in The Apartment are wickedly ironic, juicing every scene with additional layers of meaning. Thank you for pointing this out! I abosolutely hate when a movie uses this! I think some writers are uncomfortable writing romantic tension, and fall back on the unironic misunderstanding to create drama. A good romantic conflict involves both characters being a bit wrong or else exposes some abiguity in the relationship. Funny, I've always interpreted Baxter's acceptance of his neighbors' assumptions differently. I see it as the one place in his life that people perceive him as the pigeon as opposed to the statue, so to speak. In a story where your options consist of either abusing others, or being abused, it seems like a harmless way for him to feel on top in one small corner of his life without actually hurting anyone.